If you’re wondering how to step up your marketing game in 2018 and increase the number of leads and the amount of traffic to your site, look no further than video. Just consider the fact that Facebook alone claims to see 8 billion video views a day from 500 million users. Another interesting statistic comes from Cisco which predicts that online videos will account for more than 80% of all consumer internet traffic by 2020. Not only is video an extremely popular form of content, but studies have also shown that video content contributes to improved conversion rates and click-through rates, both on your landing pages as well as in your email marketing campaigns by 80% and up to 300%, respectively. As you can see from the stats above, video is indeed a powerful way to reach your target audience and improve your bottom line. And in this article, we’ll show you 8 tools that will help you create videos to promote your content on social media. Camtasia is a well-known name when it comes to screen recording software. It’s easy to use and is available for both Windows and Mac computers. On top of recording your screen, Camtasia allows you to record your webcam either simultaneously as you record the screen or just the webcam alone. It also offers editing tools which allow you to trim, split, and move the clips, add audio effects, transitions, animations, and more. Camtasia is a great choice if you want to capitalize on how-to content but it can also be used if you want to create more “vlog”-type videos. It offers a 30-day free trial after which you can purchase a license for $199. If you don’t want to spend a lot of time editing your videos and want them to be more spontaneous, using Facebook Live and YouTube Live is your best bet. Live streaming allows you to engage your followers and subscribers in real time and they can receive notifications when you go live. Keep in mind that if you use the native apps, you won’t have many creative options to spice up and brand your videos, however, you can use an app like OBS to add interesting overlays such as a link to your landing page or a product you’re talking about, intros, outros, and more for an engaging viewer’s experience. It’s worth mentioning that OBS is open-source, free, and can be used on both Mac and Windows computers. Finalize the video and then easily share it on your website or social channels. You can create both landscape and square videos and find plenty of inspiration and examples on Animoto’s website. On top of being a web app, Animoto also offers apps for iOS and Android as well as a 14-day free trial. Plans start at $8/month for an annual subscription. Powtoon allows you to create animated videos and has premade templates that are easy to customize. The editor uses a drag-and-drop interface which makes it very user-friendly even for complete beginners. You can use Powtoon to create marketing videos as well as explainer videos which are especially popular with businesses that target consumers. With Powtoon, you also get access to royalty-free music and the ability to export your video in PDF and PPT formats. Powtoon offers free and paid plans, with paid plans starting at $19/month. If you’re always on the go or want to be able to create videos even when you’re not at your computer, then Vlogit is the app for you. 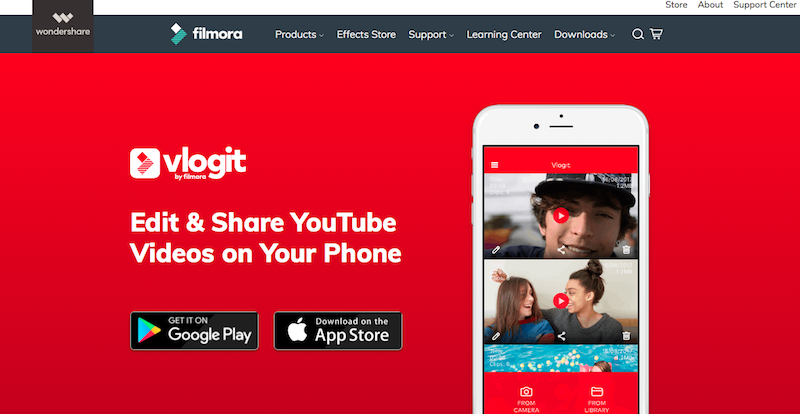 Created by the same company behind Filmora, Vlogit is available for both iOS and Android devices. The app features several animated intro presets that you can customize and add to the beginning of your YouTube videos, animated text and emojis, and the ability to record voiceovers, add sound effects or music from their library of royalty-free tracks. Additionally, you can add Picture in Picture overlays, your channel logo or pop-up graphics to your videos. The app is completely free to download and use. Similarly to Animoto and Powtoon, Magisto allows you to upload your videos, photos, and other content you’d like to use, choose one of their templates, and then publish the finished product. It’s another web-based app that comes highly praised by the press. It’s also a certified partner of Facebook, YouTube, and Instagram so your videos will be in good hands. 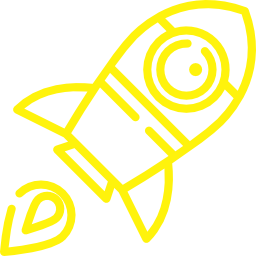 The app allows you to upload your videos with their native player and distribute them not only on social media but also in email campaigns and video advertising campaigns. You’ll also get access to insights so you will be able to tell how your videos are performing. Magisto offers an iOS and Android app as well as a 7-day free trial. Paid plans start at $2.49/month. VideoHive may not be a video creation tool but it will help you when it comes to branding your videos. You’ll find hundreds of different logo opener files, titles, lower-thirds, and other motion graphic elements. 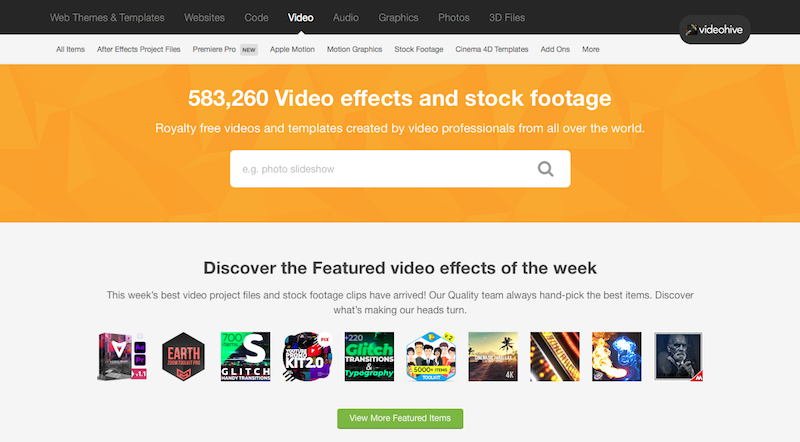 You can also find video backgrounds and stock footage that you can use in your videos. You can find templates for software like Adobe After Effects and Apple Motion and all of the items come with a detailed set of instructions to help you customize the template which can then be added to your video file. If you need soundtracks or music tracks for your videos, look no further than the YouTube Audio Library. Using these tracks is the best way to ensure your video won’t be flagged for copyright infringement. Tracks span across multitude of genres and you can even filter the tracks according to the instrument, duration, or licenses. Use the music during your intro or outro or simply add it as a subtle background throughout the entire duration of your video. Creating videos for your business is not difficult once you have the right tools. The best part is that you don’t need any special or expensive equipment to start – you can use your webcam or your smartphone and upgrade if you decide you need more features. However, you will need tools to edit and share the videos so use our list above as a starting point on your mission to create videos for social media promotion.